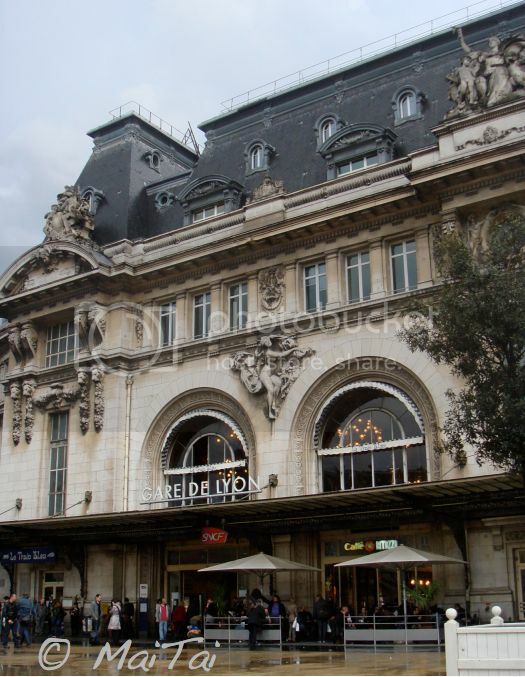 Most high speed trains going from Paris to the South of France depart from the Gare de Lyon. 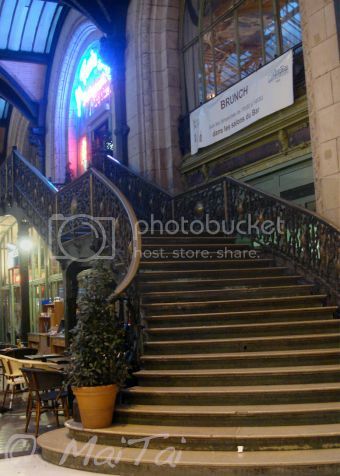 I always try to get there half an hour early, so I have time to stop by the 'Train Bleu', a beautiful and ornate restaurant and bar within the station. Looking through the arched windows of the first floor..
you can see it's magnificent crystal chandeliers, giving a hint of the old fashioned splendor inside..
Once you go through the revolving mahagony door..
you are transported to the grandeur of an era gone by. 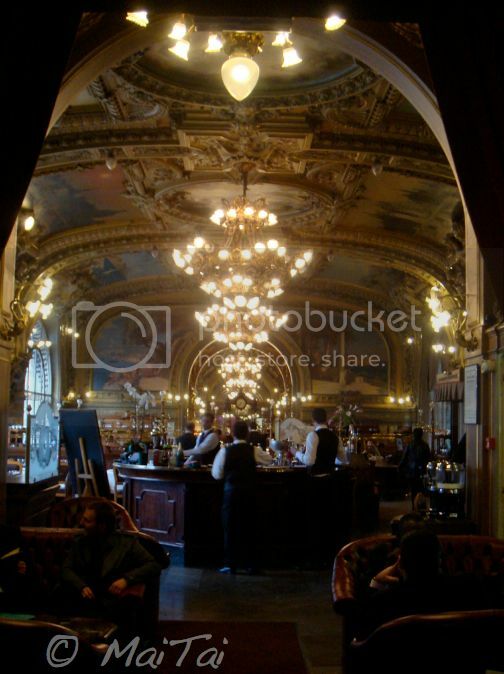 The restaurant opened in 1901, it's large room has gilded arches and ceilings, wooden panelling, brass fittings, parquet floors, leather banquets and 41 vast paintings, covering the walls and ceiling. 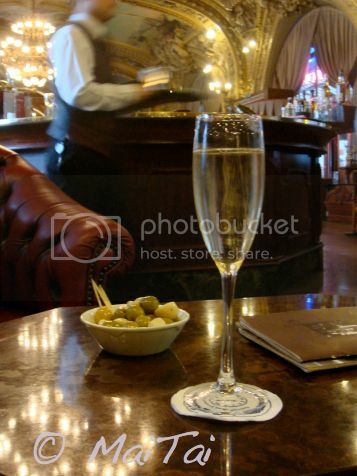 I just love the opulence and elegance of this epoque. my 'photographer' had an unsteady hand ;-) Still wearing LFDSDV, Farandole necklace and Jumping boots, minus the Bolide(s) that is, lol. 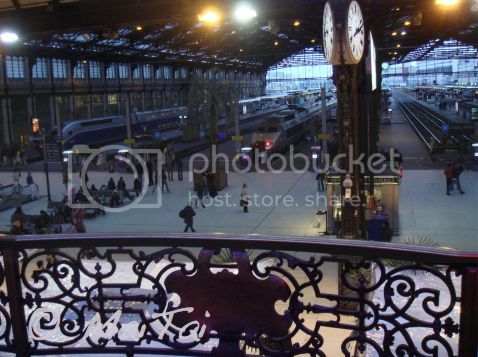 Stepping outside and seeing my train waiting, I could not imagine a more romantic way to leave the city of lights. Your photos are lovely! I've heard so much about this place, but we've somehow missed it on our Paris trips. Next time for sure. Dear Deja Pseu, happy you like the photos! Like you, I kept reading about the TB many years before I actually went there. 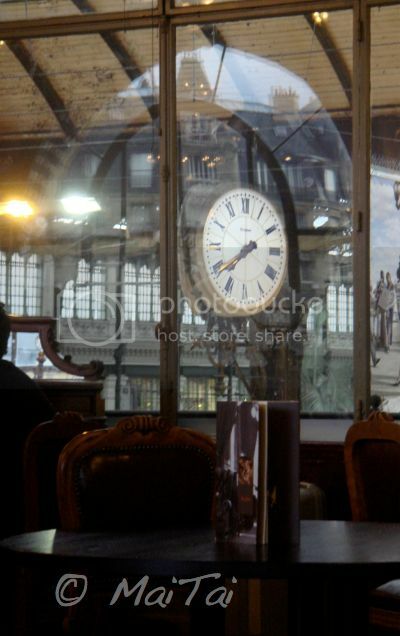 The prospect of having lunch or dinner in a train station was never quite enough motivation to make the trip..I still remember though the first photo I saw of the decor, it must have been 25 years ago.. it just blew me away, just as much as it does today. Dear Mai Tai, thank you for sharing once again. I love the Train Bleu, and have been a few times, even though the trains to "my" South of France (Southwest) don't leave from the Gare de Lyon (unfortunately). Can't wait to see the Bolide, with Spring in the air it will be a lovely addition to to your accessories. How delicious; how utterly romantic and so much the Paris of the imagination. And to know that it actually does exist . . . ah, too wonderful. You've made it a "must do" experience for me, MaiTai. Thank you for keeping the romance alive in all of our lives through your lovely and insightful eyes. 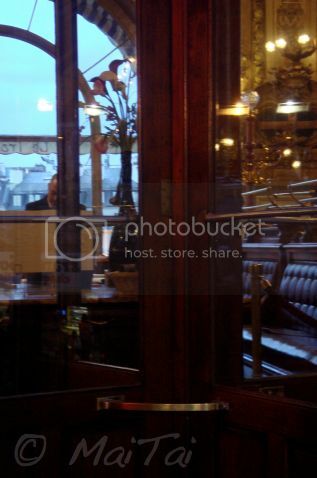 I had dinner in 2007 at Le Train Bleu. It´s magical!!! One of the most beautiful restaurants I´ve seen!Wishing you a nice Easter too. Happy Easter to you too dear MT! Love these photos of the station...couldn't have said it better myself, I feel as though I am right there with you <3 Hope all is well!! Dear emilyatheart, your comments always bring sunshine, here's to the things in life that make us happy! Many thanks, dear FauxFuchsia, and Happy Easter to you too! Happy Easter dear MaiTai. I've never been to Le Train Bleu but I've heard so many good things about it... And your lovely pics make this place seem even more magical....Some day I'll be lucky enough to go there myself. Thank you for sharing that moment with us. thank you for contributing such truly stunning pictures of your travels. We enjoy every moment! wow this looks really divine. next time i'm in paris...!! 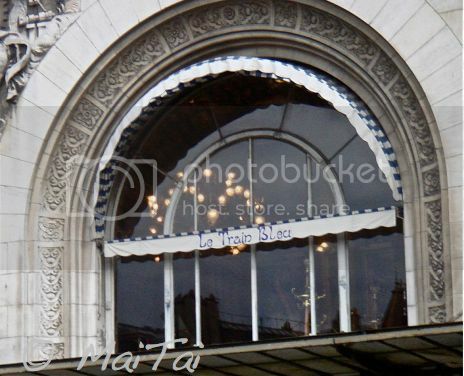 Lovely photos MaiTai - another landmark for the "to do" list;-) I hope the next week goes by a la Grande Vitesse til you get your Bolide:-) Happy Easter! MaiTai, thanks for sharing this lovely restaurant! 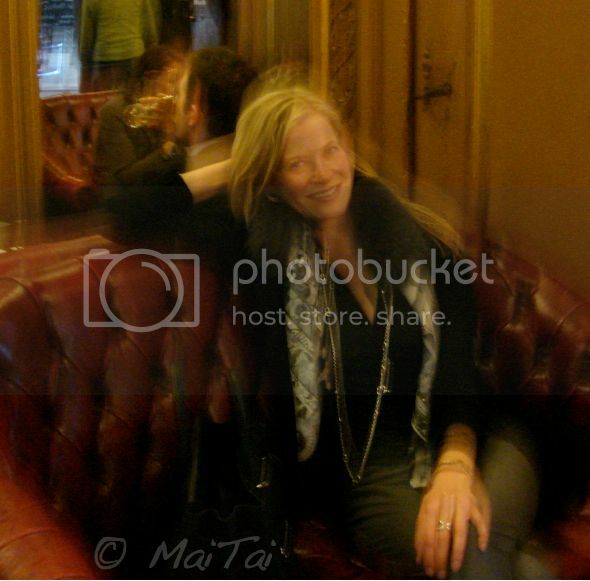 Wld love to drop by when I visit Paris next =) You look lovely in the photo even through the shot is shaky, hehe. Many thanks dear Scarf Addict, hope one of your many travels will bring you to Paris soon :-) No Grande Vitesse to speak of for the moment, so far the days have passed at what seems like 'esgargot speed', lol! I'm in Paris since yesterday - looks like we just missed each other! I'll try to drag DH and DD and DS to Le Train Bleu. Thank-you for the lovely description, MaiTai! Lovely photos, many thanks again and again for sharing...always a joy.